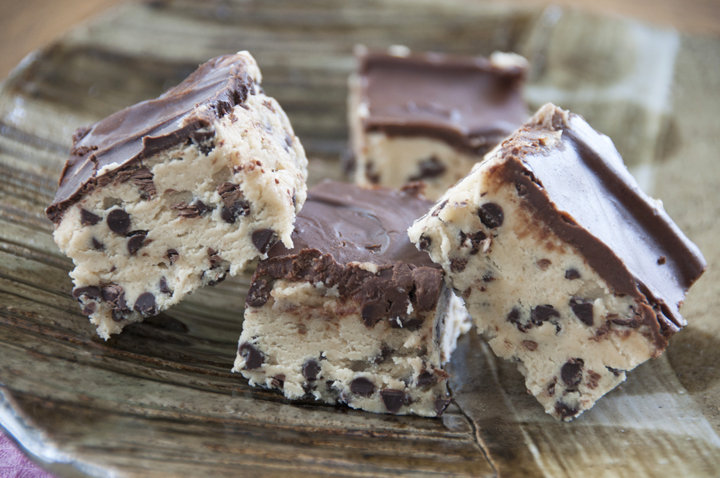 No-Bake Chocolate Chip Cookie Dough Bars recipe made up of a rich layer of melted chocolate and peanut butter on top of thick chocolate chip cookie dough. They are an egg-less dessert and no baking required! I’m back from Boston and had a fantastic time! Of course, what stood out to me was the FOOD. The North End “Little Italy” in Boston had some amazing Italian restaurants that we were able to eat at – “Giacomo’s” and “Panza”. I can not even explain to you how good the food was – each had a long wait to be seated (they are very small and in high demand) and both of these restaurants were well worth it. I don’t even know which I enjoyed more, but I know I’d go back to Boston in a heartbeat just to eat that food again. We also had a great time at the baseball game! I was very impressed by Fenway Park (as much as I hate to say it, being a Yankees fan and all) and enjoyed exploring the stadium that is so full of history and taking in my first ball game of the season…even if it was only 50 degrees! 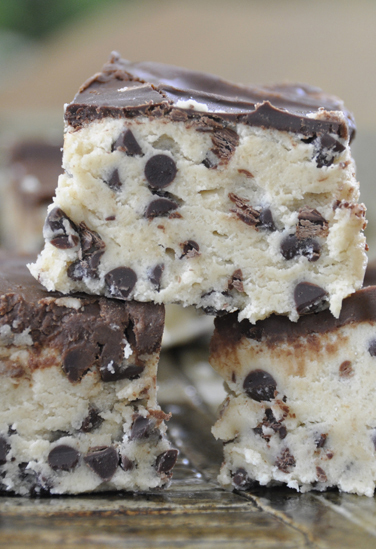 Who else is constantly tempted to sneak some raw cookie dough when baking? I always give in to the temptation with the excuse of “taste testing”….sometimes even going back for a second taste, JUST to be sure. Come on, it’s the best part of the baking process and I think everyone on planet earth has to agree with that. 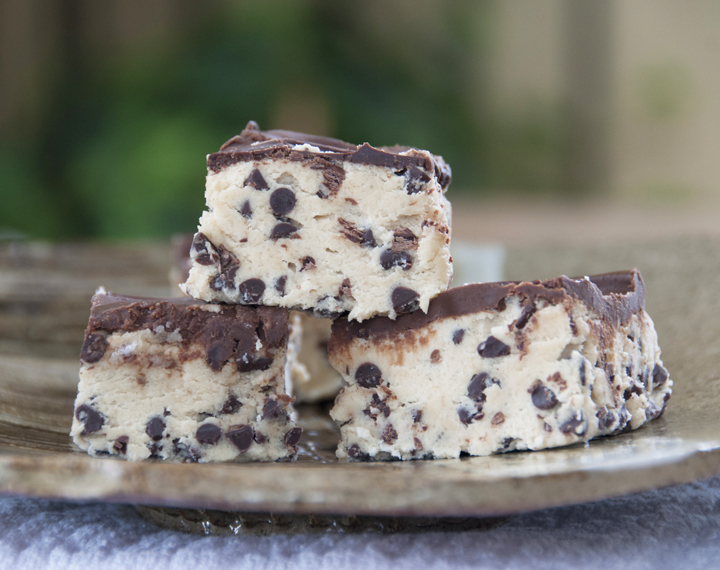 These no-bake chocolate chip cookie dough bars contain no eggs and are basically like eating chocolate and peanut butter-covered raw cookie dough. Have you tried my no bake monster cookie dough energy bites yet? This dessert is basically a big ol’ slab of cookie dough topped with a delicious, rich layer of melted chocolate and peanut butter. You really can’t go wrong with the trio of peanut butter, chocolate, and cookie dough, am I right? These bars are best kept refrigerated. I let mine sit out for 5-10 to soften up a little before I cut into them to make it easier. You should also try my chocolate chip cookie cups with cookie dough frosting! Enjoy! 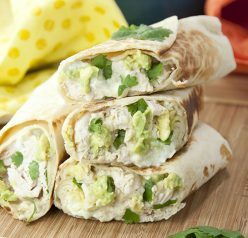 I love this recipe, it looks so easy and delicious! I really need to make them! Pinned! I would gladly eat that whole batch in one sitting. I am happy to hear thy you had a great time in Boston! ummm YUM! Love that these are no-bake, too! No bake comes in handy sometimes!! Thanks, girl! Good golly wow – these bars are not suitable to be looked at after having only a chobani yogurt! Glad you had a blast in Boston, Ashley – but gladder you are back! Glad you had a blast in Boston, Ashley – but gladder you are back!!! Thank you Shashi!! It’s good to be back! Oh my gawd these are ridiculous! In a very very good way : ) We’re heading up to Boston in a few months to visit family so I’m going to have to check out those restaurants! Yes definitely check them out!! The prices aren’t bad at all, either! 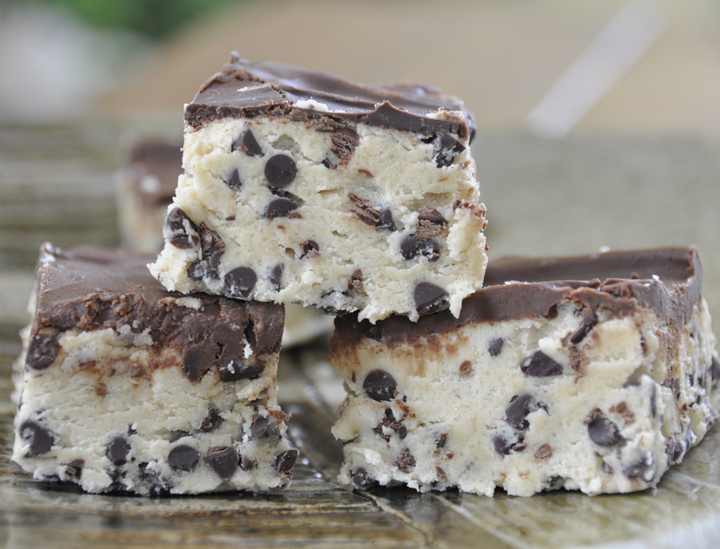 These chocolate chip cookie dough bars look amazing! I enjoy cookie dough better than the actual cookie. I would LOVE these! So glad you had a good time in Boston! I would have a good time making and eating these bars. In fact, I probably wouldn’t be able to stop eating them! You got that right!! Thanks, Laura! wow, chocolate, peanut butter, AND cookie dough all in one? I’m much in favor. “Little Italy” in Boston sounds amazing!! I can’t remember the last time I’ve been in Boston, but now I really want to go. I had been about 10 years ago but didn’t remember anything about it! It’s so fun! THAT IS A SERIOUS COOKIE DOUGH BAR!!! They are soooo thick! and then…um…WHAT?! You topped it with melted chocolate & pb??! omgeeee yum! They are pretty much heaven! YUM, these bars look totally good. Cookie dough is the bestest! What tasty treats! How delicious! Get these in my face NOW! Delicious but I think you left out an important step – lining the pan with parchment paper before pressing in the dough so it’s easy to get the cookie dough slab out of the pan? (Wishing I read the original blog that you got this recipe from before I made them..would have seen that step was missing from your write up.) 🙁 Also – you’ve got a few typos in your recipe. Oh my gosh I’m so sorry!! I can’t believe I forgot to add in that step 🙁 I added it now. I feel so stupid! Again…sorry!!! I’d buy heaps of these if they were for sale. MUST TRY recipe, unless I want to spend the next few nights just dreaming about it. can I marry these please? Wowza. Any excuse to eat cookie dough is good enough for me. 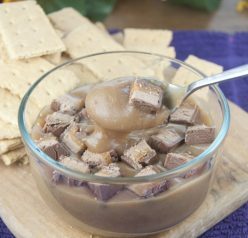 I am finding no-bake recipes for when it gets too hot to bake in the summer. This looks like the perfect recipe! Wow, those look fantastic, totally going to try making these! These look so decadent and I love that they are no-bake! Ive just checked ive got everthing in im going to make them right now my daughter will love them . These babies should be illegal. They are sooooo decadent! Unfortunately they are soooo yummy too. And addictive. Can I replace the peanut butter with something else? Peanut butter disgusts me :/ I used to like it but after I had my son I hated it due to the pregnancy and now I just can’t stand it still. Just made these. Delicious. 🙂 Thanks for the recipe! Thanks so much for letting me know! I’m so glad you liked them! I made these the other day, but I put them on top of BROWNIES! Yes, I made brownies (extra thin, to allow room for the cookie dough layer), and let them cool, then put this recipe right on top of it. then topped with just melted chocolate chips. I didn’t want peanut butter. I forgot to mention, I ended up with more cookie dough than brownies, so I will be making cookie dough buckeyes! wow, looks delicious, i really want that for my brunch snack…. A no bake treat that looks as good as this sounds very appealing to me. An absolute luxurious richness of flavors,yummy. They look fantastic. Thank you so much for sharing. Could you freeze these? I make up christmas goody tray would like to add it to. Sure can! Just wrap them really well. HI ASHLEY Kindly tell me we r using all purpose flour in them and not cooking it. is it ok to let it uncooked? i m confused kindly help me out waiting thanks. It’s fine. I’ve never gotten sick from it. Happy thanksgiving! Hey I am an 11 year old from Beebe Middle School in Arkansas and I am making these for a project. They look good! Peyton, thank you for your comment! I hope you love them as much as we did! Eating raw flour is unhealthy, it can lead to serious food poisoning, and if you get any complication or an agressive form of E-coli from eating raw flour, it can even lead to death. I have no doubt that these cookies are unbelievably delicious, but it is not recommended to eat uncooked flour. We can take as an example the delicious Ben&Jeery’s cookie dough ice-cream, that i’m sure a lot of people know. Even though the cookie dough they use is real cookie dough, the process that they use to make them includes pasteurisation of the eggs and decontamination of the flour through enzyme deactivation, which is a heat treatment to make it safe for eating, that i’m sure you have no possibility to do it at home. So i think you should be really careful with eating raw cookie dough. To my knowledge, what you are referencing was an isolated incident linked to store-bought, ready-to-bake cookie dough products. It is my belief that by purchasing quality ingredients and following safe handling practices in your kitchen, raw flour is no more dangerous than any other raw food product, be it meat, flour, or even fruits or vegetables for that matter. If it is still something that concerns you, however, it is very easy to toast your flour first: simply spread the flour on a baking sheet and bake at 350ºF for 4 to 5 minutes. It’ll give it a nice toasty flavor too. Yes, the case that lead to death was, indeed, an isolated incident as far as i know aswell, from consuming raw cookie dough products. And of course, considering what pesticides use now on fruits and vegetables, i’m sure they are not as healthy as they once were. But i remember how my mother never let me eat the cookie dough raw when i was little, before she was baking the cookies, she always warned me that i will get tummy aches from the raw flour. I try to be as cautious as i can, if not for me, for my family. I wash well all the food that can be washed, and cook anything that can be cooked or is supposed to be cooked. But thank you very much for the advice about the flour. Have a great day! These were unbelievably good!!! My son loves chocolate chip cookie dough and he said this was the best ever. I only had 1 cup of the mini chocolate chips but it still came out great. Also, I started off making the topping with milk chocolate chips and didn’t like the flavor so then I made it with semi-sweet chocolate chips and it was perfect. So making these again! 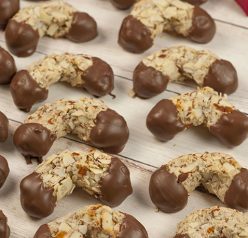 These look like cannoli filling topped with chocolate. I don’t think anyone could go wrong with this. Made these for a monthly birthday celebration at work! These are absolutely delicious and everyone raved about them. Easy to make too! Thanks! Anybody tried doubling this and putting it in a 9×13? I want enough for a crowd.